Every day I seem to run into new issues where I need to reexamine what I know about the world. It's a very complex world, and getting more and more complex every day. So, I'm going to comment on it here. Albert Einstein supposedly once said, “You do not really understand something unless you can explain it to your grandmother.” I think I understand Time Dilation, and I think it can be explained relatively simply. And I don't need to use complex mathematics (which mainly help prove and compute Time Dilation) or incongruous, fantastical examples, like somehow viewing a clock on a space ship that is a kazillion miles away moving at a kazillion miles per hour while at the same time they are looking at the clock on their kitchen wall on Earth. I'd like to explain Time Dilation in a somewhat different way. 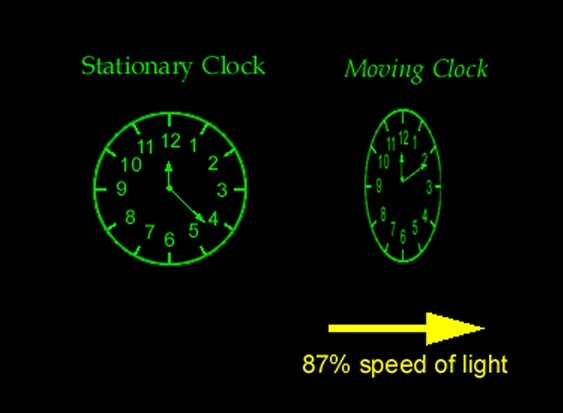 First, it is very important to understand that Time Dilation has only to do with the movement of an object or person relative to the speed of light or to a stationary object. It has absolutely nothing to do with the movement of a moving object or person relative to another moving object or person. Second, instead of two people using different clocks that the other person cannot possibly see, let's use a single natural clock -- a pulsar that both can see. We just need to pick a pulsar that pulses at an easy-to-use rate -- say one pulse every 10 seconds. Using such a "clock,"
1 pulse every 10 seconds = 6 pulses per minute. 31,553,280 pulses when you include 2 leap year days. Next, let's assume that, on January 1, 2500, a pair of astronomers who also happen to be 25-year-old twins, decide to perform a Time Dilation experiment. The two astronomer's names are Homebody Jones and Traveler Jones. The experiment will involve Traveler Jones and his wife taking a space ship on a journey to Alpa Centauri. Alpha Centauri is 4.3 light years away from Earth, and it is one of the nearest stars to our Solar System. Homebody Jones will wait back home on Earth. Since there is no way for either party to see what is happening with the other party via some magical TV signal, Time Dilation will be measured by counting pulses from that distant pulsar. On Earth, Homebody Jones can observe the pulsar's pulses occurring at the rate of 1 pulse every 10 seconds as described above. 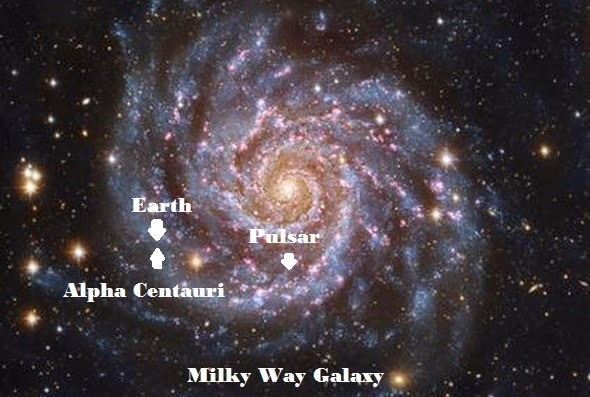 The planned route to and back from Alpha Centauri is within the plane of the rotating beam from the pulsar, and the route will be at a right angle to the oncoming beam from the pulsar, so there will be no effect on pulse counts caused by the speed of light. The experiment is expected to take 10 years, Earth time. From the point of view of the two people traveling on the space ship, however, things are soon very different. They have determined that, aboard the space ship, Traveler Jones will have to travel very close to the speed of light before the effects of Time Dilation will enable him to observe the same pulsar pulsing at an average of 1 pulse every 1 second. As the space ship begins to accelerate, the number of pulses per minute from the pulsar appears increases due to Time Dilation. Traveler and his wife record the pulses as arriving more and more quickly until the ship reaches its cruising speed where the pulses are recorded as arriving at a rate of slightly more than 1 pulse per second (to compensate for the time spent accelerating). Life and time aboard the space ship, however, will seem to be ticking along normally. The two passengers feel no effects from the slowing down of time aboard the ship. They still go to bed at 11 p.m. as measured by the clock aboard the space ship, they still get up at 7 a.m., Traveler Jones still has to shave every morning, they eat breakfast at 7:45 a.m., etc. To them, it doesn't seem like time is slowing down, it appears that everything outside of their space ship is going faster. They can see that the pulses from the pulsar are coming at a faster rate. They can also see that planets orbiting distant stars are orbiting at a faster rate. One month into their voyage, as measured by clocks aboard the space ship, Mrs. Traveler Jones unexpectedly (or maybe according to plan) becomes pregnant. When they reach a point just beyond Alpha Centauri where they calculated they would need to turn around, they decelerate down to a stop. When they've done that, they also see that the pulses from the pulsar have slowed down and are once again arriving at 1 every 10 seconds. Then they accelerate again to return to earth. Very soon, the pulses from the pulsar are again reaching the space ship at the rate of just slightly more than one per second (in order to compensate for the acceleration and deceleration). On the voyage home, Mrs. Traveler Jones has a baby boy right on schedule, at the end of a nine month gestation period as measured by her "body clock" and by all the various kinds of clocks aboard the space ship. Then, on January 1, 2501, according to the clocks aboard the space ship, they arrive back on earth. Traveler is now 26 years old and his son is 2 months old. They meet Homebody Jones and find that on Earth it is January 1, 2510. From Traveler's point of view, he and his wife traveled forward in time nine years. Only one year passed for them while, from Homebody's point of view, Traveler and wife were gone for ten years. During that time, Homebody aged 10 years. He is now 35 years old -- nine years older than his twin brother. 1 pulse (on average) every second = 60 pulses per minute. 31,553,280 pulses counted during the ONE year trip. No one was ever ahead of or behind the other in time. The experiment confirmed "time dilation." Time slows down for a person who is traveling very fast. But the person doing the traveling sees and feels no effects on himself or his ship. To people on Earth, it would appear that time had slowed down for the traveler. It took 90 months for them to have a baby. For Traveler Jones, it would appear that time had sped up on Earth and in the rest of the universe, as evidenced by the increase in the rate the pulses from the pulsar were received. For a longer explanation that includes WHY time slowed down, go to my Time Dilation web page by clicking on the link HERE.